These falafel were the inspiration that kick-started me into planning a six course chocolate themed Middle Eastern menu for a dinner party last week. I saw a recipe for falafel salad in the summer edition of the Co-operative’s Share magazine and it immediately appealed to me. I decided to separate the falafel from the salad and add raw chocolate and almond spread. The falafel recipe I have from the Vegetarian Cookery School used tahini, so I couldn’t see why a nut butter wouldn’t work instead of a seed one. I mixed and matched between the two recipes and came up with a version I am really happy with. Finely chopped 1 medium onion and three cloves of garlic. Fried them over low heat with 2 tsp cumin seeds in 1 tbsp olive oil until soft. Drained 2 400g tins chickpeas ( I normally cook my own, but didn’t have any dried chickpeas to hand) and poured into my food processor. Blitzed. Added the onion, 2 heaped tbsp raw chocolate almond spread, 1 large duck egg, a few sprigs of parsley, 1 heaped tsp ground coriander, 1 tsp turmeric, ¼ tsp cayenne, ¼ tsp rock salt. Ground this together in the food processor. Rolled the mixture into 23 ping-pong sized balls and placed in a moderately heated frying pan covered in 2 tbsp olive oil. Cooked for about 3 minutes, then turned and cooked for a further 3 minutes. Placed in an oven proof dish and baked at 180C for about 15 minutes. The falafel were really good and had both the taste and texture of the real thing (those eaten off the street in Egypt), even though they weren’t deep fried. The chocolate was not obviously noticeable, but it definitely added a certain depth and gave added interest. They were certainly better than the pale imitations that are commonly available in UK supermarkets. They were accompanied by a salad with tahini dressing and adorned with a drizzle of chocolate balsamic vinegar. We haven’t had much produce from the plot this year due to the inclement weather, but the salad did include some of our baby beet leaves, radishes and garlic as well as some of our herbs and flowers. This was served alongside roasted vegetable and halloumi couscous using Cornish asparagus, rhubarb, red peppers and onions that had previously been marinaded in lemon zest and juice, garlic, sumac, chilli and olive oil. Shockingly, there was no chocolate present in this dish. 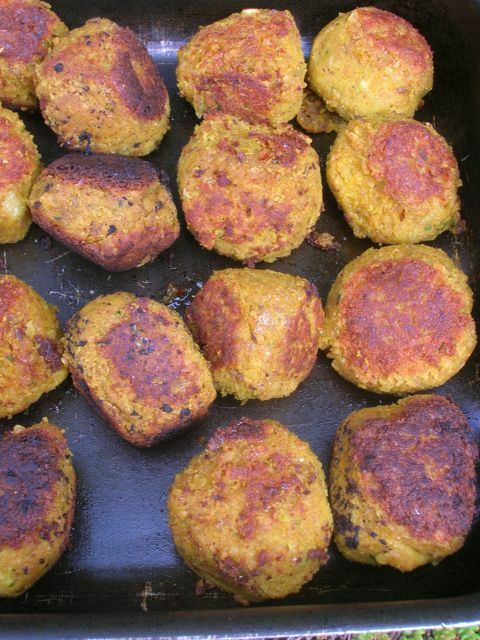 This month’s AlphaBakes letter is F and F is for Falafel – baked falafel. This monthly challenge is hosted alternately by Caroline of Caroline Makes and Ros of The More Than Occasional Baker. Even though I’ve heavily adapted the recipe, I’m submitting this to Jac’s Bookmarked Recipes as my inspiration came from the Co-ops Share magazine. I am also submitting this to My Legume Love Affair which, as you have probably gathered, is a monthly event sharing any vegetarian recipes that include legumes. My falafel have chick peas as the main ingredient, a highly popular legume. Aparna of My Diverse Kitchen in hosting this month, otherwise it is hosted by Lisa of Lisa’s Kitchen or Susan of The Well Seasoned Cook. Thanks Hannah. I’m thinking it would be really good to make up a batch of these for the freezer and then just bake as needed. Thanks Johanna and no it was a raw almond butter with cocoa nibs, so no sugar at all. Oh, I am going to try them out this weekend. Thanks. Chocolate falafel? Amazing. Bet they’d be lovely made with a little cocoa powder too. Really great idea! I love it already. I should really try some falafel. Why not the chcolate ones?! An interesting way to serve falafel. Thanks for participating in this month’s MLLA. I’ve never seen chocolate added to falafel before, these look really tasty! Thanks for sending them to Alphabakes. I have never tried falafel before – It is one of those treats that I look at but then buy something I know I like because I have tried it before! I think I will have a go at making my own – homemade is always more tempting and tastier anyway! Thank you for sharing this! Wow – What a great idea!!! I am continually surprised and inspired when I visit your blog Choclette. You always manage to come up with great ideas. Thanks for including it in Bookmarked Recipes. The roundup is now live. I love falafels but haven’t tried to make them yet – am pinning! Chocolate in a falafel? Only by Choclette 🙂 I had the most amazing falafel when I went to Jordan earlier this year. I wish I could try one of yours. I am also intrigued by your six course chocolate themed menu and am off to check it out now! I have never heard of a chocolate falafel. I am used to eating the normal type. What will it taste like?